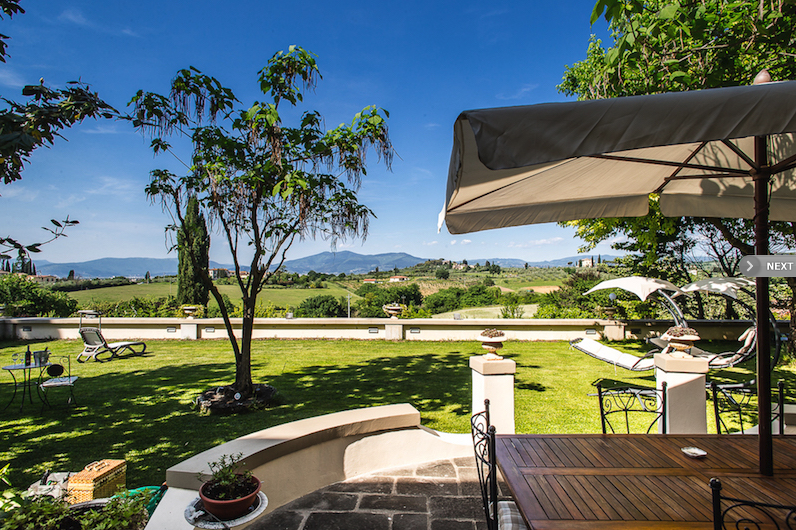 On arrival to Villa Broncigliano you will feel as though you own your very own Tuscan villa and when check out time comes round, you won’t want to leave. Not just because the property is stunning and faultless on every aspect, but because owners Franco and Perla can’t do enough for you. 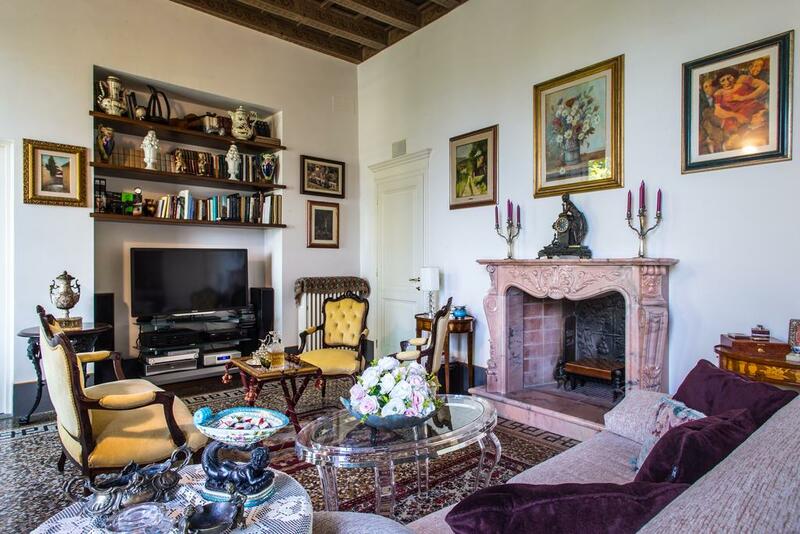 They restored this historic 15th century villa and it acts as their home and a luxurious 5 room B&B. Their philosophy is about art, culture and design. It’s about showcasing their local surrounds. And it’s about pampering and luxury hospitality. 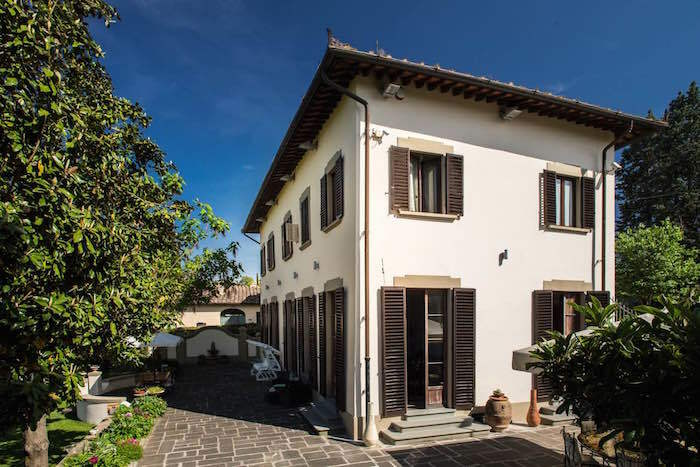 Villa Broncigliano is located in Scandicci, a short 15 tram ride to Florence’s central station and a short 25 minute drive from the centre. 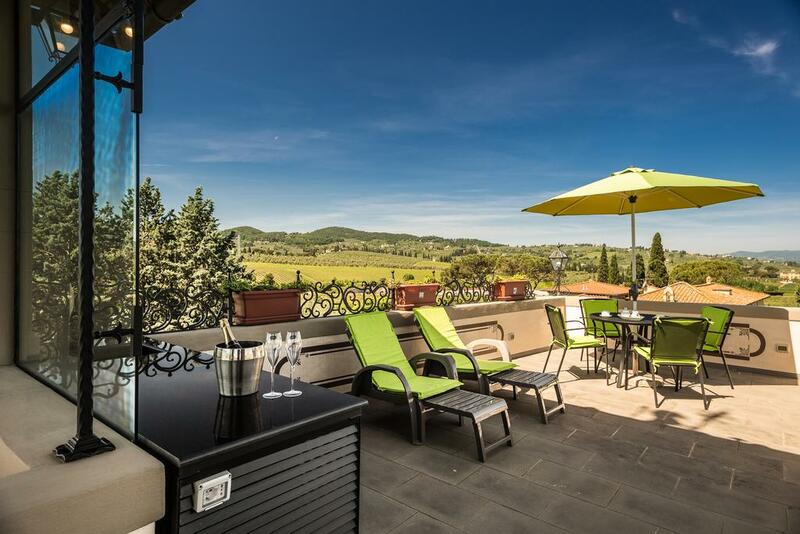 It comes complete with a rooftop terrace, jacuzzi and sprawling views of the Tuscan countryside; the gateway to the famous Chianti zone. Whatever your idea of a Tuscan break is, from art to history to food and wine, Franco and Perla can make it happen. A home away from home – the view, the grounds, Franco and Perla as the consumate hosts – again, you will not want to leave. Scandicci is a well-established town and has long been a precious hideaway for Florentines wanting to escape the city crowds. It has many restaurants, bars and cultural landmarks. Its position also allows for easy access to the Florentine and Tuscan countryside, including many important and popular wine towns and vineyards of the Chianti valley. There is a cable car / tram that gets you from Scandicci into Florence in about 15 minutes and the stop is just a few minutes walk from the B&B. 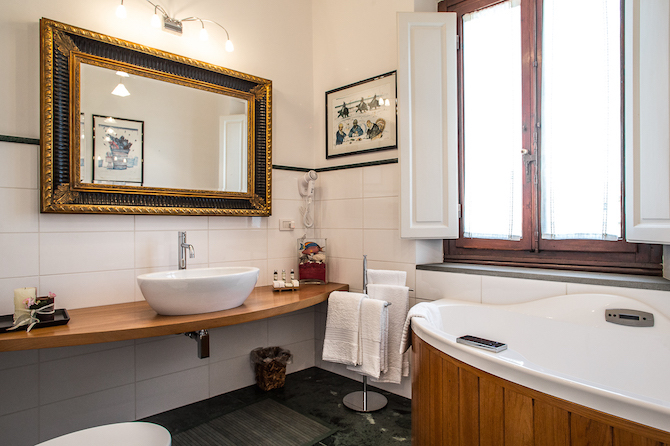 By car, the B&B Villa can be reached in approximately 25 minutes from Florence central station, and about 15 minutes Florence airport. The Villa is chic Italian style and luxury. Formerly owned by the Florentine family of the Doni, it was here that Agnolo di Francesco Doni married Maddalena Strozzi and asked Michelangelo to paint a sacred family, still known as the Tondo Doni which now sits proudly in the Uffizi Museum. A meticulous restoration of the Villa has brought its decorative period details to life with all the modern amenities you would expect from a luxury property. Rooms are set across three floors with a rooftop terrace open to guests or available for private booking with the top floor rooms. Precious and well known artworks adorn the walls and the common space – a large sitting area – spreads out on to the garden patio where there is a stylish and comfortable outdoor setting, perfect for a glass of champagne with Franco and Perla. 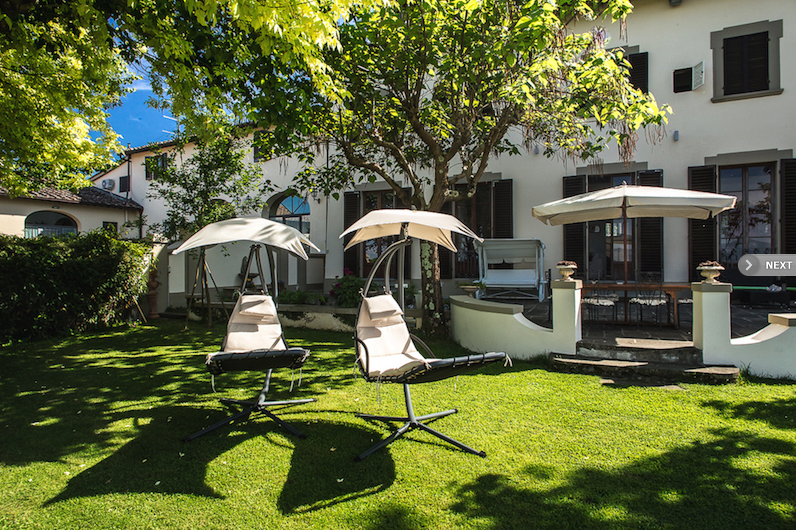 The perfectly manicured landscape gardens are an extra special touch and the perfect place to relax with a jacuzzi for use in the warmer months (there is also a pool bar for guests use) and swinging hammock chairs to sit and be mesmerised by the views that ara Tuscany. I stayed in the Orchidea room which is a deluxe spa room and features the most comfortable ergonomic memory foam mattress with hypoallergenic pillows and pure cotton and satin bed linens. It’s a room with a view alright – from the main window, the Villa grounds and Tuscan panorama spreads out before your eyes. Like each of the rooms, it features heating and air conditioning, a flat screen TV, espresso coffee machine and kettle with a section of tea, minibar, WiFi and complimentary toiletries and slippers. The highlight though? I had my own jacuzzi bath and Turkish steam room in my room! Featuring state-of-the-art chromotherapy and aromatherapy, the steam and light features will have you relaxed in no time. Plenty of towels and luxurious bath robes are provided too. There isn’t a restaurant on site, but Scandicci with its wide away of restaurants serving Tuscan and Florentine cuisine are a short walk or drive away. Franco and Perla will only be too happy to help you select a place and book for you, if not accompany you! Especially in the warmer months, aperitif or dining events are held on the property for guests. From a delicious Tuscan meal out in the garden to a cocktail evening, these events can also be organised on request. In addition, for those looking to experience the classic Tuscan activity of wine tasting or a vineyard and cellar visit, Franco and Perla can organise this too. The San Michele a Torri winery is a 10 minute drive away and offer wine tastings with Tuscan snacks (like their famous finocchiona, pork cold cut with fennel made on site) or a heartier lunch option and even olive oil tasting. Other dining options include a lunch or evening in Florence – only 25 minutes by car or 15 on the tram. Breakfast is in the main dining room of the villa with tables for each of the guests. It’s a luscious affair with a spread of fresh fruit, local produce and Tuscan charcuterie and cheese. Eggs are also on the menu and a varied selection of sweets and freshly baked pastries. Classic Double rooms start at £175 (€200). Breakfast and free wifi is included. The deluxe double room with spa bath featured here is priced at £220 (€250) and boasts garden access, minibar, breakfast and wifi. Born to Italian parents, Maria always knew Rome was her destiny, although she was raised in Melbourne. With a formal background in political science and history, she is now a food and travel writer and contributes regularly to USA Today, The Telegraph, Condé Nast, CNN and Fodors. She has worked with major brands including Dubai One TV, Etihad, Marriott, Rocco Forte Hotel Group, Baglioni Hotels, Pullman, Paris Tourism Board and many others. Her popular and award-winning lifestyle blog, HeartRome is read in over 100 countries, has been featured in BBC and Vogue among others and boasts a 30,000 strong social media following. Her first book, I Heart Rome (Smith Street Books / Rizzoli) is a collection of recipes and stories and was released worldwide in November 2017. In Rome you’ll find her walking the streets of Trastevere, checking out the latest bar for an aperitivo or dining with friends.